The Formula T1s are ludicrously light, in fact 335 grams per end light (with 160mm rotor) and they have a great lever throw and feel and possibly the easiest reach adjustment I've ever used. The lightness is a bit of a surprise really, given that the brakes are aimed at the aggressive trail/gravity end of the market (Remi Thirion rode a set to the top step of the podium at the last round of the World Cup DH in Andorra). At the lever end, the two gold knobs control reach (that's the dial actually on the lever) and then the spinning knob is the FCS adjuster. 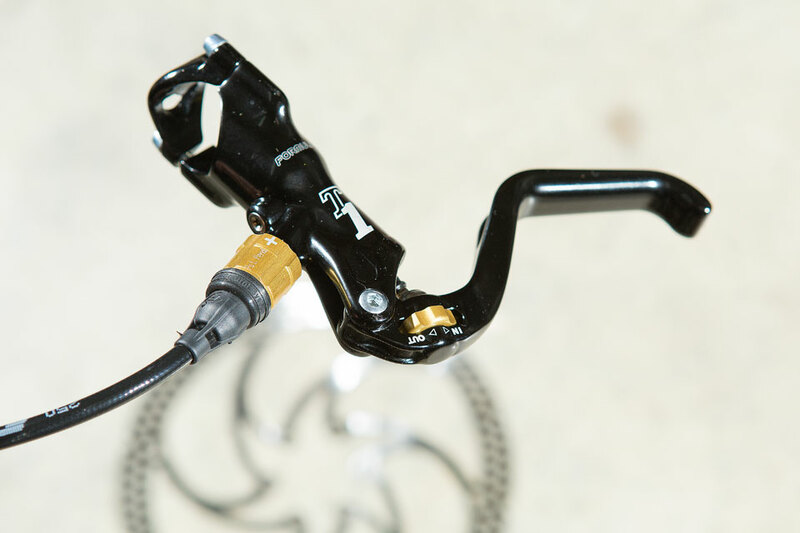 This allows for tool-free adjustment of the lever's contact-point (free-throw) to suit the rider’s personal preference and ergonomic needs. Down at the caliper end of things the big deal here is Formula's new Enhanced Caliper Technology (ECT) which basically means that the pads retract into the calipers more than they used to (and more than other brands). This means way less brake rub and easier setup, and you can imagine that Italian brakes are not the easiest things to dial in.